Just 300 metres from Berlin’s lively Hackescher Markt square, this boutique hotel features a fitness centre, rental bikes and stylish rooms with free Wi-Fi. Museum Island is only 400 metres away. Decorated in a vintage British style, the rooms offer large windows and wooden floors. Comforts include a flat-screen TV with satellite channels, an iPod docking station and a private bathroom. Monbijou Hotel offers a restaurant and bistro, and drinks can be enjoyed at the bar.. You can also relax with a book in the Monbijou’s library area. 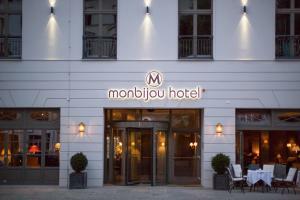 A large variety of cafés, bars and shops can be found within a 5-minute walk of Hotel Monbijou. Hackescher Markt S-Bahn Train Station is 150 metres away, providing a connection to Alexanderplatz and the Friedrichstraße shopping street.